In 2007 my friend KJ and I took a cruise of the Greek islands on the Perla, a small-ish ship (1095 passengers, 395 cabins). We started out in Athens and visited Crete, Delos, Mykonos, Patmos, Rhodes and Santorini. 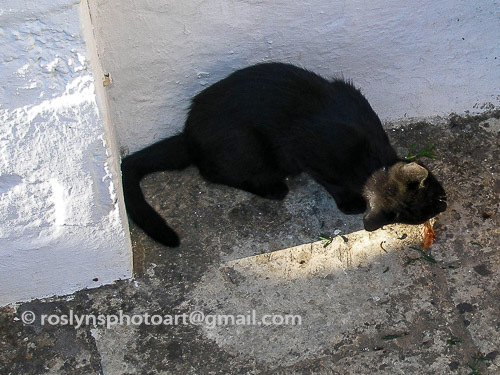 I encountered quite a few cats along the way and took photos of some of them. The photo above was taken at the Roman Agora in Athens. 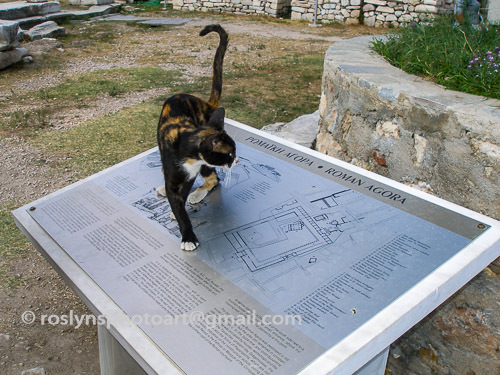 The cat took a shine to us and followed us around for a while, then jumped up on the map to help us plan our visit. 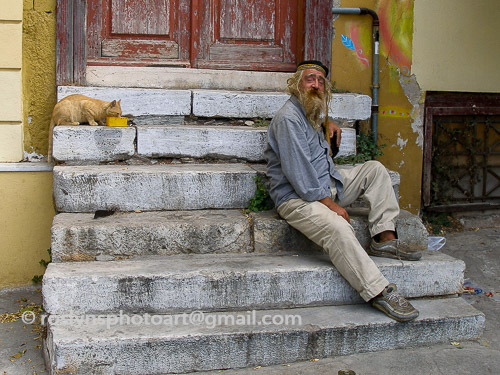 This photogenic gentleman was well known and I was told collecting money from tourists for his cats padded his ouzo budget, but that was okay with me. One for the cats, one for the ouzo sounded fair and I was happy to contribute! We spent a considerable amount of time in the Plaka area of Athens. KJ was and is still a souvenir store junkie so what could I do? As we were leaving one evening I turned around and saw this Tuxedo cat sitting outside this pottery store. 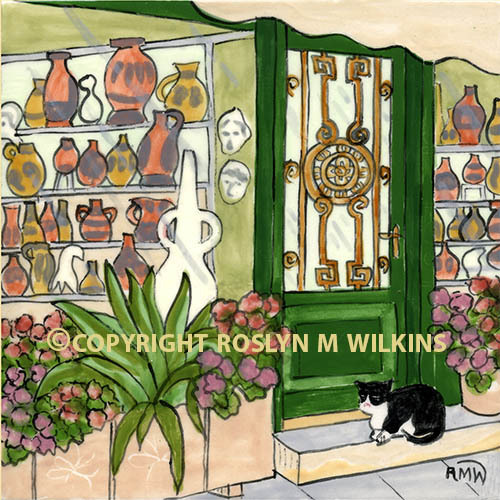 It turned out to be one of those serendipity moments as when I returned home I painted a ceramic tile of the scene. This Tuxedo seemed very serene, waiting patiently for dinner further along the street. 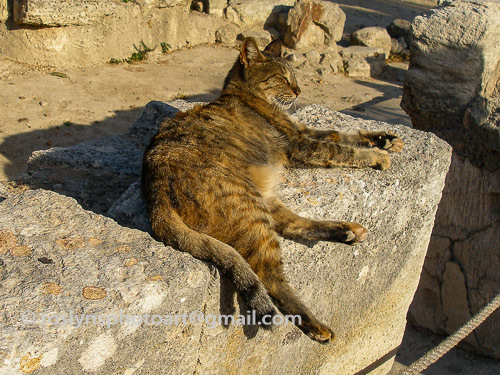 This beautiful ginger tabby was enjoying the sun at the Palace of Knossus on Crete. While the tour guide droned on and on and on I was trying to be as zen as this cat. 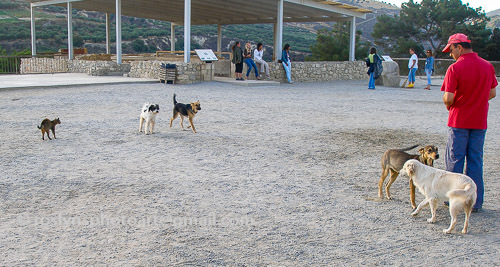 Still at Knossus, these dogs were roaming around. 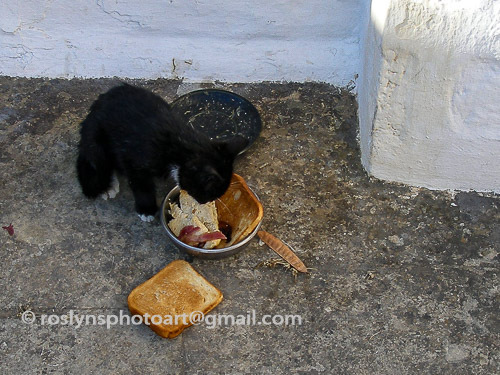 I was concerned about the lone cat at left but he seemed able to take care of himself. 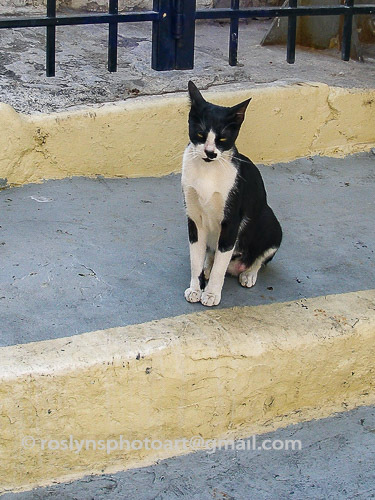 Another Tuxedo, this one was at Patmos. But this little guy won the jackpot with toast, chicken and bacon. In my travels in other countries, outside of the US or the UK, I have to admit I am troubled by the number of cats and dogs in the streets, seemingly without a home. But they all seem well fed and taken care of. 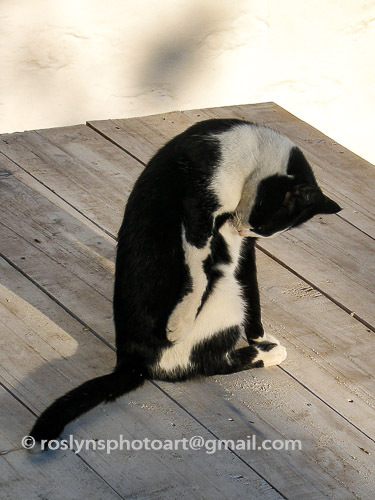 Certainly there is horrendous abuse of pet cats and dogs in the US, so I can’t point fingers. It’s just a different attitude towards animals as pets. 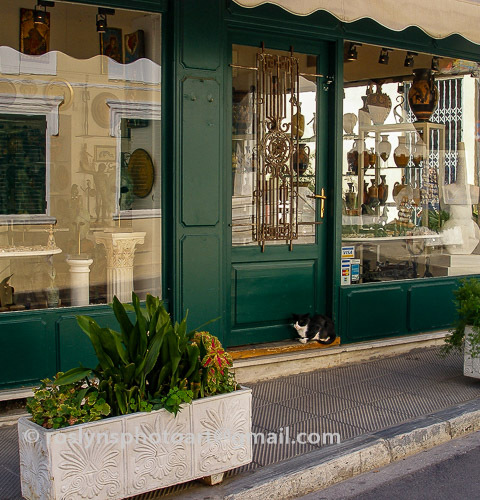 Categories: Animals, Cats, cities, felines, Pets, Photography, Travel | Tags: Agora, Athens, ceramic, Crete, Feline Friday, Greece, islands, Knossus, ouzo, Patmos, Perla, Plaka, Roman, tile | Permalink.